As of right now, Guinness World Records claims that the highest human flight with a rocket belt is 152 feet, accomplished by Eric Scott in 2004. But they may need to update their records soon thanks to Martin Aircraft Company in New Zealand, whose Martin Jetpack finally showed the world it can fly—really fly. The public debut of the Martin Jetpack back in 2008 showed great potential, but the unveiling never showed that it could actually fly. Over the years, it's simply continued to strut its stuff only a few feet off the ground, creating suspicion about its true abilities and subjecting itself to ridicule by industry professionals. But now they've finally proved that Kiwis can fly. The flight test in the video above saw Glenn Martin's experimental personal flying machine reach a height of 5,000 feet above sea level, flown by remote control with a weighted crash-test dummy helming the pilot position. 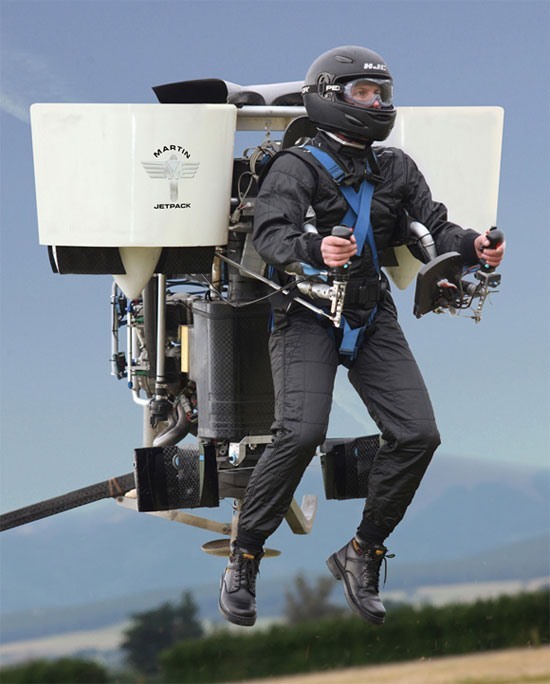 It was the first time the Martin Jetpack was recorded performing more than just ground-hopping. Also, the test successfully proved the jetpack's safety features, releasing an emergency parachute at 2,000 feet, leaving the dummy unharmed and jetpack undamaged at landing. The jetpack Martin has been developing for the past 30 years weighs over 250 pounds and relies on two powerful superfans to provide flight. Powered by ordinary petrol, it can fly for over a half hour, climbing more than 1,000 feet per minute and cruising at speeds up to 62 miles per hour. But for the filming of the above video, Mr. Martin said, "We limited the jetpack to 800ft/min climb so the chase helicopters could keep up." Right now, Martin Aircraft is in an intensive testing period, hoping to deliver to the world both manned and unmanned versions to prospective customers, most likely government and military divisions, within the next 18 months.